U.S. Memory painter Bernice Sims was born on Christmas Day, 1926 on Hickery Hill in southern Alabama. She raised her six children after her husband deserted the family and was very active in Civil Rights Marches and encouraged voter registration in '60's in Selma, Alabama. She started to paint in the 1980's after she had knee cap surgery. She enrolled in an art class and became inspired to paint her life memories after visiting US folk art genius Mose Tolliver in his home in Montgomery, Alabama. "I paint things important to me. I want to save memories of my family and life in my art." 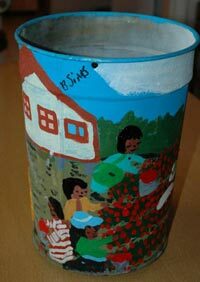 Her memories of picking tomatoes with her family in the fields can be seen painting on the side of a berry can on Redkettle site. The details and joy of growing up in the South comes through in her generous use of vibrant color and rounded lines. Unfortunately her family house was destroyed by fire a few years ago leaving her art and stories as the only record of her memories now.